GRAND FORKS, N.D. - June 17, 2016 - Seven-time World of Outlaws Craftsman® Sprint Car Series champion, Donny Schatz, continued his dominance of River Cities Speedway on Friday night, as he passed Logan Schuchart with 19 laps left in the First Leg of the Northern Tour to score his fifth victory in seven races at the track since 2013. Schatz, who is a native of nearby Fargo, N.D., put on a show for his family and friends in attendance, as he started the feature in the seventh position and charged his way to the lead just past the halfway point to score his series-leading 10th victory of the season and the series points lead. "This is what racing is all about - having your family here is cool - to be here and see it and experience it with us," an emotional Schatz said. "The fans are just as important too, so I am glad to see everyone here tonight and glad they stuck it out. It turned out to be a great night for us and I am happy to be here and look forward to Sunday." Schatz's remarkable feat can only be matched by the driver he defeated, as David Gravel scored his fifth podium finish in seven races in the month of June. "Donny [Schatz] was really good late in that race," Gravel said. "I thought I had one of the best cars early, but as the race went on, Donny got better. It was a good race and I am happy with second." The night started with Brad Sweet capturing his seventh quick-time award of the season, which is second-most among all drivers in 2016, just one behind Joey Saldana. Sweet, Jacob Allen, Daryn Pittman and Gravel all scored heat wins to transfer to the dash. In the six-lap dash, Allen's Shark Racing teammate, Logan Schuchart, in the No. 1S Mark Pell Tire Service/Marty Thompson Investments car, started on the pole and dominated the race to score his first dash victory and feature pole-position of the season. When the green flag dropped for the 40-lap feature, Schuchart easily pulled away from second-place starter Pittman, but he could never get in a rhythm as the race was plagued early by accidents that caused temporary stoppages in the race. Allen, Jason Johnson and Mark Dobmeier all encountered trouble early and had to retire in the opening laps. As the race progressed, drivers began to settle in which allowed for a green-flag run during the middle stages of the race. The run, which lasted over 20 laps, allowed Schatz to climb up the leader board, as he moved into the runner-up position just before the halfway point in the race. On lap 21, Schatz utilized slower lapped traffic to made his way around Schuchart for the race lead. Schuchart remained glued to the defending champion's bumper, as the two diced through slowed lapped traffic. With just seven laps remaining, another red-flag caused a stoppage in action, as Jordan Adams lost control of his car on the front stretch and flipped. Adams was fine and walked away from his car, but the red flag set the field up for a final dash for the $10,000 paycheck. On the final restart, Schatz pulled away from Schuchart, as the Hanover, Pa. -native had his hands full with the No. 5 Big Game Treestands/JRC Transportation car of Gravel. Gravel muscled his way around Schuchart for second and set his sights on the Schatz for the lead. Gravel did not have enough time to catch the leader, as Schatz cruised in the final seven laps to claim the First Leg of the Northern Tour victory at River Cities. "Man, these guys worked their tails off to get this race in and thanks [to all the fans] for sticking with us, I know we had a late start but it could've been a heck-of-a lot worse," Schatz said referring to the two hour delay as track and series officials worked to prepare the track following overnight rains. "Tony Stewart's Bad Boy Off Road guys are incredible...getting through traffic was a lot of fun, being in the right spot at the right time played a role in it too. We were lucky we didn't get caught up in a crash in the first corner on the first lap - that's the way it goes, you have to be lucky some days. "As I get older it seems like biding your time is something you try to do less and less. You just got to keep pushing. Like I said, these guys work their tails off to give me the best car they can, and I do my best to give them the best I can." Gravel settled for the runner-up finish, the second time he has done so to Schatz in the month of June, with the other coming at Lincoln Park Speedway on June 8. "Logan [Schuchart] was really strong tonight, but Donny just got the best of us - he's really good here," Gravel added. "We had a pretty good restart there and kept up with him for a couple of laps, but he's just so consistent hitting his marks and you can't keep up because you can't make any mistakes either. "We'll take second tonight, you always want a win, but we'll take second and look forward to Sunday." Schuchart captured his fourth top-five of the season and his third podium finish, with the other two coming at Ocean Speedway on April 1 and Weedsport Speedway on May 22. "The driver didn't make good calls before the race, but we were close," Schuchart said. "It was a very good run, I felt like I really didn't need that last yellow. I felt like I was catching Donny a little bit before that last caution and then I just got a bad restart. "I'm just proud of my guys and they deserve a win, so we're going to keep working hard and working at it. We're definitely a lot faster this year than we have been the last two years, so if we keep working at it, we're going to get there." The World of Outlaws Craftsman Sprint Car Series will travel to Aberdeen, S.D. for a Sunday showdown at Brown County Speedway. For more race information and ticket purchasing options, visit: www.WoOSprint.com/Brown-County-Speedway. 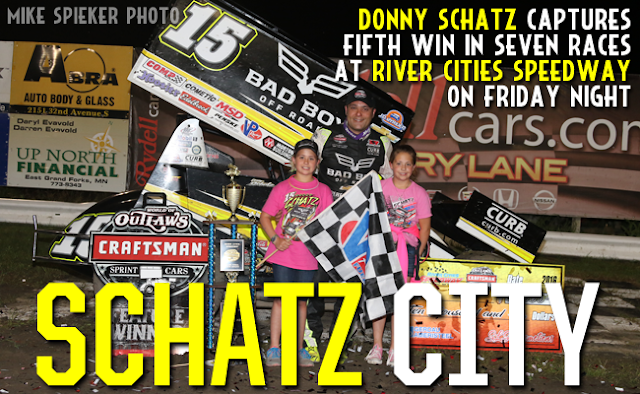 RACE NOTES: Donny Schatz scores his series-leading 10th win of the season, and reclaims the points lead from Brad Sweet...Schatz has now won five of the last seven races held at River Cities Speedway...Brad Sweet’s seven quick-time awards places him just one behind Joey Saldana for most this season...Logan Schuchart captures his first pole-position for a feature this season. CONTINGENCY WINNERS - MSD Ignitions ($25 cash): Jason Johnson; MSD Ignitions ($50 cash): Donny Schatz; Penske Shocks ($50 cash): Logan Schuchart; JE Pistons ($50 cash): Daryn Pittman; VP Racing Fuels ($50 cash): Jason Sides; Edelbrock ($50 cash): Joey Saldana; Comp Cams ($50 cash): Cory Mack; Morton Buildings ($50 cash): Cory Mack; Cometic Gasket ($50 cash): Jade Hastings; Super Flow ($50 cash): Casey Mack; Craftsman/Sears ($100 cash): N/A;KSE Racing Products ($100 product certificate): Jade Hastings; Comp Cams ($50 product certificate): Donny Schatz; JE Pistons (Set of Rings): Greg Wilson; JE Pistons (Set of Rings): Jacob Allen. SEASON WINNERS: Donny Schatz - 10 (Volusia Speedway Park on Feb. 14, The Dirt Track at Las Vegas on March 4, Stockton Dirt Track on March 18, Stockton Dirt Track on March 19, Silver Dollar Speedway on April 2, Lincoln Speedway on May 19, Weedsport Speedway on May 22, Lincoln Park Speedway on June 8, Knoxville Raceway on June 11, River Cities Speedway on June 17); Brad Sweet - 6(Volusia Speedway Park on Feb. 13, Volusia Speedway Park on Feb. 14, Cotton Bowl Speedway on Feb. 26, Ocean Speedway on April 1, Bakersfield Speedway on April 15, Plymouth Speedway on May 13); Daryn Pittman - 4(Royal Purple Raceway on Feb. 27, Perris Auto Speedway on April 16, USA Raceway on April 18, New Egypt Speedway on May 24); Shane Stewart - 4(Arizona Speedway on March 6, Devil's Bowl Speedway on April 23, Lawrenceburg Speedway on May 30, Granite City Speedway on June 15); David Gravel - 3(Thunderbowl Raceway on March 12, Tri-State Speedway on May 14, I-96 Speedway on June 6); Joey Saldana - 3(The Dirt Track at Las Vegas on March 3, Devil's Bowl Speedway on April 22, Jacksonville Speedway on May 4); Kerry Madsen - 2(Eldora Speedway on May 6 and 7);Lance Dewease - 1(Williams Grove Speedway on May 20); Chad Kemenah - 1(Fremont Speedway on June 3);Jason Johnson - 1(Placerville Speedway on March 24); Terry McCarl - 1 (Knoxville Raceway on June 10); Jason Sides - 1(I-30 Speedway on April 26); Greg Wilson - 1(The Dirt Track at Charlotte on May 27). World of Outlaws Craftsman® Sprint Car Series Statistical Report; River Cities Speedway; Grand Forks, N.D.; June 17, 2016.